While western investors are lining their pockets with Papua New Guinea's rich natural resources, all the government is getting in return is a degraded environment. WESTERN investors are slowly destroying Papua New Guinea's lush green rainforests with their utter disregard for environmental safeguards while raking in profits from the island's immense natural wealth, be it copper, gold, lumber or oil. And the PNG government, its hands bound by a foreign debt to the tune of US $ 2.5 billion, will do nothing about it. The revenue from the Ok Tedi copper and gold mines, which is run by the Ok Tedi Mining Ltd (OTML) and located on the Indonesian side of PNG, constitutes 70 per cent of this Pacific island nation's national income. The PNG government has a meagre 20 per cent stake in these mines, while industrialised countries hold the remaining 80 per cent -- US-based Amco Minerals Co and the Australian Broken Hill Proprietary Co. Ltd 30 per cent each, Degussa and Metallgesellschaft of Germany 7.5 per cent each and the German government 5 per cent. Ever since a landslide in 1989 destroyed a temporary dam, which had prevented the release of waste sediment from the mines into the Ok Tedi river, 80,000 tonnes of sediment are being dumped daily into the river. OTML, which twice released large quantities of sodium cyanide into the river, admits the water is too polluted for agricultural and drinking purposes, but, as the area is geologically "unstable", the company says it is not economically viable to build another dam. The PNG government seems to be totally unconcerned about the pollution caused by the mines. Following a letter in April 1992 from Australian Prime Minister Paul Keating, in which he criticised the environmental standards being practised at Ok Tedi, the PNG government issued a warning to all foreign governments and environmental organisations to keep off from the controversy over the environmental impact of its mining activities. Earlier this year, the Wau Ecology Institute in Papua New Guinea lodged a case with the Amsterdam-based International Water Tribunal (IWT) against the OTML. In retaliation, the PNG government refused visas to IWT-commissioned scientists and PNG foreign affairs minister Michael Somare warned Harry Sakulas, director of the Wau Ecology Institute, against "environmental activism". Despite this, IWT has studied the project data and recommended the OTML find a safe way to store and treat the wastes, failing which "the activities of OTML should be phased out". IWT has also suggested that the foreign shareholders ensure that environmental standards comparable to those in their own countries be maintained at the Ok Tedi mines. In response to this suggestion, a German parliamentary delegation recently petitioned the German government to sell its stake in the mines. Mining has increased the danger of floods in the region around because of increased sedimentation in the Ok Tedi and Fly rivers. OTML admitted "the river bed will rise by two or three metres" over the next 20 years in a report carried in a PNG magazine, The Catalyst (Vol. 21 No. 3). Copper content in the water of the two rivers has risen by as much as 1,000 times since mining began in 1984, while iron, manganese, lead and zinc have increased 200 times. Arsenic content and turbidity have doubled. These levels are much higher than accepted pollution levels in the western world, especially that of copper (170 times) and lead (50). Fish stocks have almost disappeared from the rivers and the humus layer of the soil in the rainforests around the mines has got contaminated. Government expenditure on the Ok Tedi mines has been heavy. Between 1981 and 1990, according to a government statement in November 1990, Ok Tedi accounted for 70 per cent of the country's total capital spending. On the other hand, OTML's output made up about a fifth of PNG's export earnings. As a result, other development projects in the country were denied funds and agriculturists of the region were not adequately compensated. The PNG government's earnings have been used to either service its debts or re-invest in the Ok Tedi mines. OTML paid no tax, royalty or rent to the government till 1987 and the tax and royalty paid since then is much less than originally envisaged. The government has also paid for the infrastructure and technology imports required for the mines, but it has been given no share of the profits accruing from the marketing of copper concentrate, one of the most lucrative ventures in the mines, the contract for which is held by Metallgesellschaft. A similar story at the Panguna copper mines on the nearby Bougainville island culminated in a violent uprising and declaration of independence by Bougainville inhabitants from Papua New Guinea. 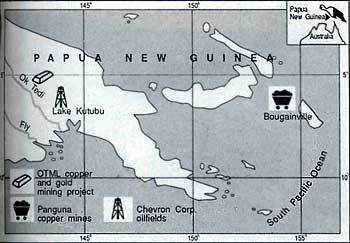 The Panguna mines were owned and operated by a subsidiary of the British company, Rio Tinto Zinc Corp, under the Bougainville Copper Mining Agreement of 1972. The local inhabitants called for a review of the agreement and demanded compensation be paid as promised to landowners as also US $11.5 billion as a fine. When the company ignored the demands, the islanders formed the Bougainville Revolutionary Army and, after a bloody sabotage campaign against the mining company, had the mines closed down in 1989. Other rich deposits in Papua New Guinea such as timber and oil have also been thrown open to foreign investors. In 1987, a committee headed by Judge Thomas Barnett found Japanese companies, which account for 90 per cent of PNG's timber industry, had not only logged more trees than allowed in the contract, but also cheated on royalties and taxes. Finally, in 1990, the country placed a two-year ban on new logging permits. The newest item on the exploitation list is oil. USA's Chevron Corp has struck oil at Lake Kutubu, which is set amidst unspoilt rainforests nearly 300 km inland from the Gulf of Papua on the east coast. Chevron flew in equipment and personnel in helicopters so that the rainforests would not be cut down to construct roads and it has also kept its camp and pipeline away from watersheds to avoid contaminating the water. But local inhabitants complain this is not enough and have demanded enhanced community services, a connecting highway and compensation for the 600 ha of forest area that is to be cleared. Chevron has agreed to pay US $45 million towards the construction of the highway, schools and clinics. Apart from Chevron, which holds a 19.4 per cent stake in the Lake Kutubu project, British Petroleum Co. owns 19.4 per cent shares in the project, three Australian companies jointly hold 34 per cent and a subsidiary of Japan's Mitsubishi Oil Corp. owns 4.5 per cent of the company's shares. PNG's options for economic development through conventional means are few, though some non-government groups are trying to organise small-scale community-based logging operations to replace transnational projects. Steps are also being taken to promote awareness of environmental threats among land-owners.